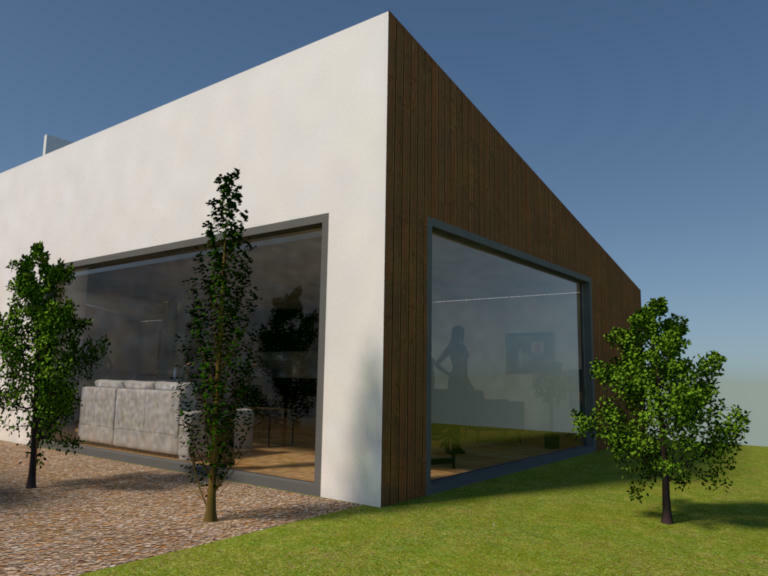 External corner of house I am designing for my family - self build. Some cracks in interior between ceiling and walls probably down to me, roof is mono-pitch not flat - not a perspective effect. Light and shadow do look impressive as does your project, i look forward to seeing the interior views to see how they are illuminated. I am surprised that neither of the large windows has an opening aspect to them, bit warm in summer? 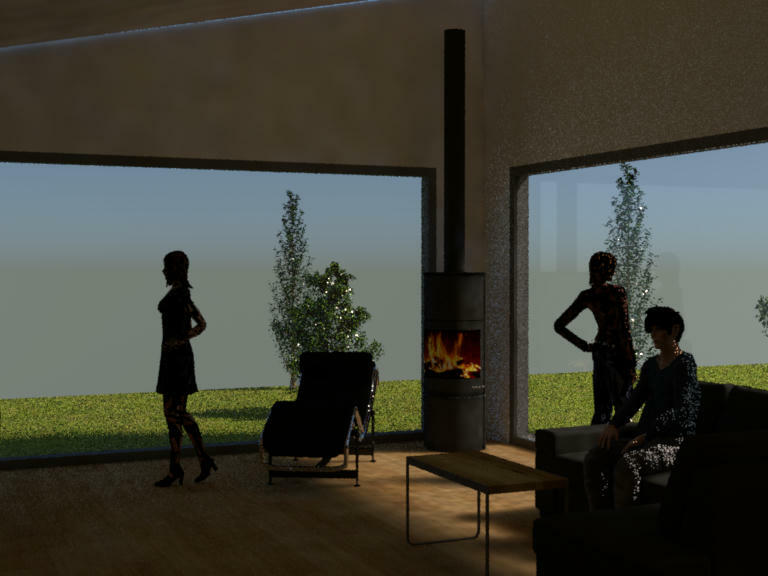 Actually sliders are a possibility but only if budget allows so I am designing on the low budget side - its a self build trimmed back in design, steel frame, insulated panels etc. There is a regular sized glass door adjacent to the one of the left which is not visible so access ok but as you point out we might be the only ones complaining about the Scottish heat wave. It took around one hour, gave Mitsuba 6 of my 8 cores. Used photomap integrator with recommended irridiance caching after seeing blotchiness on the first test pass. Integrator - tried 36 samples per pixel for a test and then ramped up to 400. Other options pretty much the defaults that Mitsuba supplies. Thermals needed as opposed to more openings then. Any chance of the same image with sh3d's built in renderer as a comparison? Did you figure out the gap where the ceiling meets the wall, guessing its room alignment but it depends on how the ceiling was created, box or auto. I'm agree with Mike on this point. With the actual technology, all large glassed windows cannot be more larger than 2 meters. It's due to fragility of the glass so the pressure of the atmosphere and the force of the wind giving vibrations and can break the glass. "Thermals needed as opposed to more openings then"
Ceiling wall aligment? I need to check but I think the first issue is my own micro mis-alignments - the walls that are of non-constant height are tricky because I start off with one such wall but then break it into sections to change external textures - the breakpoint is calculated to be the appropriate height by DreamHome but as soon as you move the breakpoint to where you want it then its off. Just need to sit down with a calculator at some point and calculate the intermediate heights with precision. I can see that DreamHome is struggling with the auto ceiling because I see some error triangles when in aerial view, I think I know whats going on and I am not surprised that an auto fit ceiling algorithm would have issues connecting my top wall boundaries into a sensible profile to triangulate. I will try and make the comparison you suggest. Yesterday I was full on getting a workflow together so that I can make the process of viewing and rendering in Mitsuba easier. Mistuba, even the GUI interface was never written with the intention of people walking around and looking in different directions - its tricky to use keyboard commands to orientate the view. In addition the translator that is supplied with Mitsuba does not understand the simple transparency for windows that is exported, it needs translating into something that Mitsuba can understand. The solution was actually very nice and simple. 1. The mapping between Mitsuba co-ords and DreamHome is very simple, Y and Z need swapping. Angles need to be negated. 2. After Mitsuba has imported it is trivial in the scene script to add materials that over-ride the ones exported by DreamHome - it is particularly useful if all materials of a certain type have been named something sensible like "glass" - then its really trivial. You could see this as an opportunity that gives flexibility. 3. You can create multilple camera views in Mistuba just like DreamHome and then just click between different views. I have one file with my preferred material substitutions ( glass but also chrome ). The first file imports the other two so its neat and tidy. Adding a new view or material is trivial and only needs doing once. Now when I start up Mistuba I have everything set up and can dive straight into a render and see exactly the same as I see in DreamHome view-wise. Any simple programming language can be used to write a long script with hundreds of views / frames and so create frames to be stitched into a video. I did this once with a small object I was designing - I calculated views for a viewer sliding up and down a helical path around the object always looking towards the object. I cannot remember render settings but I chose ones that gave a fast result - 24 hours later I had a video. Right my son is pulling at me saying time for School - I better come back on this one. I have been poking around the forum looking at other people's renders some of which are really quite sharp but I note people are talking of ten hours or more. I get the feeling that some of the Mitsuba renderers ( you have a choice ) have been very carefully optimised - the guy who developed Mitsuba was part of a movement that were looking at advanced methods for speeding up rendering, cutting down on the amount of calculation by theory and insight rather than just applying grunt CPU at the problem. The photo path method I use rarely takes more than an hour given six of my eight cores and that works out just fine for me - its about the right balance. I feel good realism is necessary to get the feel of what you are designing but ten hours is too long to wait for me, that would slow down the design process. Correction "Photon path" not "Photo path". I just tried a quick and dirty comparison between renderers. This is not scientific I do not know the default Sunflow renderer very well. Someone else might "drive" it better than me. I also have recently started messing around with adding a real roof - at the moment its just a skew white block created with the CreateShape plugin - this adds the complication that the test involves an interior lit only by what is coming through the window so diffuse bounces are going to be the big players here. For the Mistuba I chose "photon mapper" and pretty much the low end defaults which are set up fast and dirty preview. For instance only 4 samples per pixel, and 250,000 global photons I would usually add a zero to both of these for something decent and then be expecting to wait for an hour I did set irridiance caching as this is usually required in "photo mapper" to reduce blotchiness. As you can see despite very low samples Mitsuba gave a realistic "quick and dirty" preview in ten minutes - give it an hour and you would have a nice image. The Sunflow run was much more difficult because I do not know it well and had to try to optimise yet complete the render in 10 minutes ( unless I wanted to spend all day on it ). The real issue in Sunflow was finding a combination that included diffuse bounces so that the windows could realistically illuminate the room yet find a combination that would show some kind of activity on the screen within a few minutes - most seemed to show no sign of anything after 2 minutes so I tended to close and move on to the next combination. It does seem in Sunflow that as soon as you opt for Global illumination and then ask for anything above 1 diffuse bounce then it all slows down to the point where a ten minute completion looks very unlikely. I failed to get any meaningful image with Sunflow other than the one presented which is "Best quality" but ignoring all extra options presented in the Advance render plugin so this was the default on "Illumination" which appears to be some low level ambient. 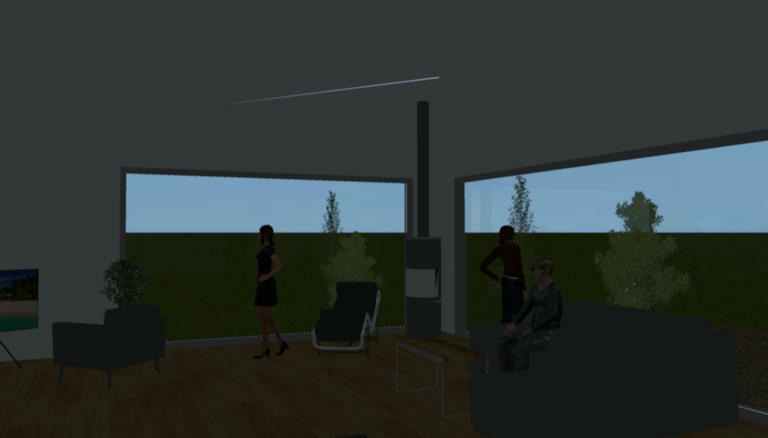 I had turned down brightness in the SweetHome options and asked for "no ceiling" lights as here I am interested in natural window illumination only. The following render took perhaps one minute, I was unable to find options to make use of the remaining nine minutes that looked like they would complete - indeed show any output within the allotted ten minutes. So what does this all say....? Jon at the current time is not a skilled Sunflow user and did not get the best out of it. I know Mitsuba is heavily optimised so as to be able to dismiss diffuse bounces that will not actually add to the result. It would not surprise me if the result was actually indicative of true relative performance. You can see in only 10 minutes chrome details are showing detail and the overall pattern of diffuse, direct and shadows are showing some level of sophistication. Not sure we have learned much here - its all a bit flakey and unscientific but I am not sure I can spend much longer on the comparison side. Its very difficult to compare different systems - I used to work on code in a very large scale CADCAM system, we were always up in time trials against competing systems. The best anyone could come up with was to sit company A's best user against company B's best user and ask them to both make the same model from stated dimensions in the shortest time they could. I guess this is a similar situation.